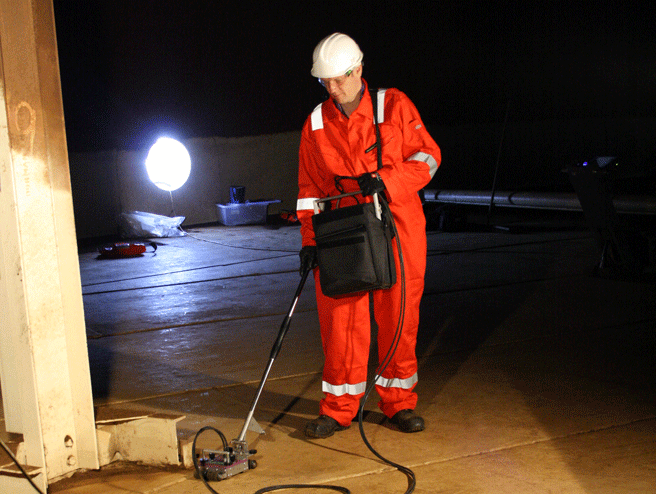 Handscan MFL corrosion detection mini-scanner is designed to complement the Floormap range floor scanners. Signals from corrosion, above the operator-controllable threshold, appear as visual and audible alarms. Its low-profile and extendable handle enable scanning in otherwise inaccessible areas of storage tanks such as the shell-to-annular area, under pipe work and heater coils. 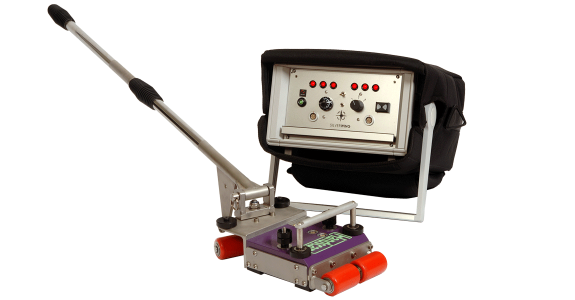 Inspection data from the Handscan can be added into the SIMS reporting software manually when used in conjunction with the Floormap floor scanners to produce a complete fingerprint of a tank floor’s condition. The operator first connects the sensor cable to the scanner head and electronics module. The MFL control module is then turned on, the required floor thickness configured, and the alarm sensitivity is adjusted using a reference pipe with known artificial defects. All the operator has to do then is push the scanner head and monitor the MFL control module for alarms. Any area identified by Handscan can then be marked for further analysis with a secondary inspection technique, usually ultrasonic testing (UT).